As women we tend to take care of everything else around us before we even think about our own needs. But we actually need to take care of ourselves first so we CAN help those around us. Just like on an airplane….if there’s an emergency, we’re told to put on our own oxygen mask first before helping someone else. It may sound selfish but think about it…. If you’re travelling with children and you pass out from lack of oxygen while trying to help them first how can you help them at all? Most people’s first reaction when they hear the words “art” or “creativity” is to say “I’m not artistic. I can’t draw. I'm not creative.” My response to that is baloney, I laugh in the face of the naysayers! I used to say exactly the same thing, and believed it for years. Now I AM an artist. Every one of us is creative, and at some point in our lives we were all artists. 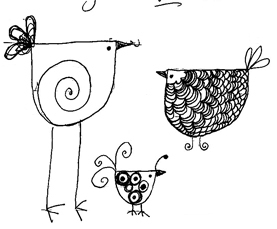 Remember the drawings we did every day as children? Bubble gum pink taffeta Princesses, fire breathing dragons, ancient mossy dinosaurs, our houses and families. They were beautiful and creative, and everyone knew exactly what we had drawn. We were proud to show them off and display them for everyone to see. Somewhere along the way encouragement to play with crayons and rainbow coloured markers teetered off. Instead we were told to do something ‘constructive’. Learn all the prime numbers (which I use ALL the time! Said hardly anyone ever....) or memorize all the Presidents of the United States. While information is valuable and fun to collect, (I’m always seeking new information) the ability to express our selves creatively is also valuable. The more I immerse myself in creativity, the more creative ideas pop into my head. It becomes like a party of ideas in there! We have all heard that music and art in schools helps kids with their other subjects, yet we relegate music and art to extra curricular activities that only the “talented” kids get to do. Can you imagine what things would be like if we were all encouraged to keep at it? Generative research shows that everyone has artistic abilities. With more training, and more diverse training, your potential for creative output increases. Sir Ken Robinson talks about how we lose our creativity over time at TED Talks. When I was a kid I remember attempting to carve animals out of the rejected bits of soap I’d find in the bathroom. I thought throwing them away was a waste, and so collected them all up and planned to make a fantastic menagerie that would become world-famous, and be shown in art galleries and museums around the world. I can vividly remember gathering all my materials and tools and setting to work. In the end I became so frustrated with what I thought were my failures, I gave up and threw it all away. I convinced myself I wasn’t talented and would never be artistic. As the years wore on I was continually stunted by my thoughts of inadequacy as a creative being. All the while I dreamed of making something so beautiful it would make people weep with joy. I pined for the ability to draw and paint, to express myself through all kinds of mediums. I envisioned myself as one of those 'cool artists' with paint in my hair and splashes of colour on all my clothes. The years went by and nothing happened. I continued to let the fear of failing restrain me from drawing and painting. 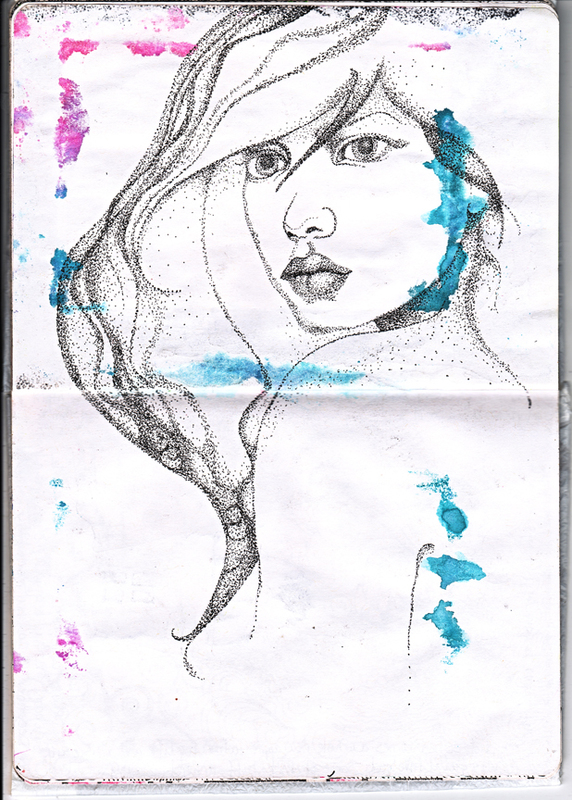 Eventually I avoided all things artsy (except for the zillions of doodles I did on all my notebooks and journals). Until one day I was asked to be the foster guardian of a tool kit full of paints and paintbrushes. I held onto that box. Took it out every now and then to lovingly gaze at the colours and promise of what they could be. The paintbrushes were well used and had paint crusted on the handles, to me they were like precious jewels. I laugh about it now because that’s what I always used to say and I came to believe it. Now I believe anyone and everyone is an artist and is creative. It’s just a skill that needs to be practiced and nurtured. 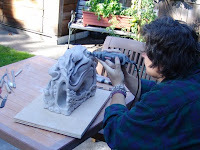 Since then, only about eight years ago, I have learned how to carve soapstone, sculpt with clay, paint and draw. I can even draw a reasonably good face now (that’s my drawing below). I am a reluctant drawer, as I still have doubts about my ability, but I know the truth behind it now. I have been practicing, and now I want to share it with everyone. I want to convince others that they can create art too and that it is fun. If I can do it I figure anyone can do it. It just takes some time and practice, and since it's fun to do, it’s not a chore! So, I'm excited to say I'm planning to hold art and creativity workshops. We will have a place to get our creative art on, connect with our inner creative child and spirit, play, have fun, get messy, take a break, breathe some fresh air and eat good food. To provide a judgment-free zone for women to be able to express themselves creatively, artistically and emotionally. To provide a place for women to retreat from daily life, get creative and pamper them selves. To provide a place for women to learn, relax, create, make art and pamper and take care of them selves. A safe place to explore and experiment artistically. Please go to my survey and add your two cents worth! 1. What do you think your artistic and creative abilities are? do you think you are creative or artistic? What's your reaction if someone asks you to draw a face? How do you feel? 2. Would you attend an art camp, even if you think you aren't artistic, if there were other activities you could do as well? 3. if you had a weekend or an evening to create art without any outside interferences what kind of class/activity would you like to do? 4. What kind of environment/situation/accommodations would you like to be in? 5. Would you like to be with other women in a fun atmosphere or would you prefer to be alone? 6. How much would you be willing to pay for a 3 day camp? 7. What length of camp would you participate in? 8. Would you be interested in attending a season's worth of workshops (for example: one Saturday a month throughout the winter)? Or just a one-time camp? any other options you'd like to see? 9. Which name do you prefer? 11. Any other thoughts you might have about this project?